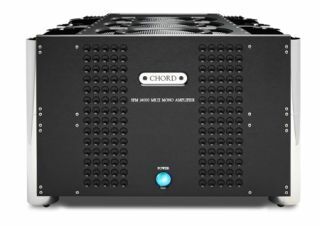 Chord Electronics' Reference power amps upgraded to MkII status | What Hi-Fi? We had a very large delivery yesterday, with the arrival of a pair of blue flight cases from Chord Electronics. Inside each one was Chord's brand-new MkII version of its Reference Series SPM 14000 mono power amplifier, yours for £24,480. To say they look impressive is an understatement. On the outside there's a new front-panel design and rear connector plate, featuring heavy-duty, gold-plated speaker terminals. And when the amps are switched on, there's a beautiful blue glow from within. Inside, there are numerous engineering refinements: a new power-control and sequencing board for simpler operation; refinements to the filter components to ensure greater high-speed performance and overall stability; and a plethora of circuit board and earthing changes to improve high-current power flow. Power delivery from the SPM 14000MkII is 700W, while the SPM6000MkII outputs 650W and costs a (slightly) more affordable £13,950. Our Chord SPM 14000MkII monoblocs were delivered along with a £25,500 CPA8000 preamp. We'll be reviewing the full combo in a forthcoming issue of What Hi-Fi? Sound and Vision. And look out soon for video footage of the entire system being installed in our hi-fi test room.